ATE Type 200 performance brake fluid is a long standing #1 choice for all cars and trucks that will see spirited or track use, or simply as a high quality fill for any vehicle. This is a great fluid for dual purpose (track /street) vehicles or vehicles like fast street cars and big trucks that see heavy duty applications. While this may not be the highest performing fluid on the market any longer, its still a great choice and a reliable benchmark. A long time favorite in the German vehicle hi-perf market, and is used as standard fill for all types vehicles that come through the service bays at VAC. Cost efficiency, and high dry resistance to boiling have kept this a favorite for many years with tons of enthusiasts. Works well with all makes of imported and domestic vehicles. Please Note: As of late 2013 'Blue' tinted brake fluid is no longer DOT approved or legal for use or sale in the USA. Sale of ATE Super Blue is discontinued but ATE Type 200 'Gold' color will thankfully continue to be available for all fans of Super Blue. All orders will be fulfilled with Type 200 "Gold". Compatible and will mix with most DOT3, DOT4, or DOT 5.1 fluids for street use. May not need to be changed for up to 3 years under normal highway driving conditions. "Gold" color to make flushing easy. Sold in (1) Litter bottles. Always in-stock! 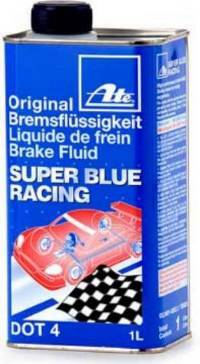 It has been determined that ATE Super Blue does not comply with the applicable US DOT Federal Motor Vehicle Safety Standard for brake fluid, due purely to blue-tint for the color. The federal standard requires motor vehicle brake fluid to be colorless or amber in color and distribution of super "blue" has been suspended. However, the same Fluid with out the Blue tint continues to be available!